Copyright 2015 Simpson et al. Licensed under Creative Commons Attribution 4.0 International License (http://creativecommons.org/licenses/by/4.0) (CC BY 4.0). Background: Observational studies suggest vitamin D deficiency may contribute to the risk of acute infections. We undertook a randomised controlled trial (RCT) of cholecalciferol supplementation as an intervention against acute infections. Methods: A cohort of 34 healthy adults was randomised to 20,000 IU/week cholecalciferol or identical placebo and followed for 17 weeks during winter 2012. Acute infections, defined as the occurrence of sustained (at least an hour) infection symptoms, either of severity 2/5 or greater or sustained over 24 h, were monitored by daily online symptom reporting, with potential infections assessed in clinic. No microbiological verification of symptoms was available, however. Primary endpoint was the occurrence of acute infection; secondary endpoints were infection duration and infection severity; and tertiary endpoints were change in serum 25- hydroxyvitamin D (25(OH)D) and adverse events. Results: No treatment effect was observed for infection risk (HR: 0.83, 95% CI: 0.53, 1.31), nor duration or severity. However, on stratification by baseline serum 25(OH)D (levels chosen on the basis of average levels in our cohort and known minimums needed for bone health), a significant treatment effect on infection risk was evident among those who were vitamin D deficient at the start of the study, such that those of baseline 25(OH)D < 40�nmol/L (n = 4) realised a 44% reduction in infection risk (HR: 0.56; 95% CI: 0.32, 0.96; P = 0.007), this increasing to 73% on restriction to clinically verified infections (HR: 0.27; 95% CI: 0.07, 1.00; P = 0.050). A similar but less consistent and nonsignificant effect was seen for infection severity. Treatment was associated with significantly higher 25(OH)D compared to placebo; however, the maximum 25(OH)D was 154�nmol/L and no adverse events occurred. 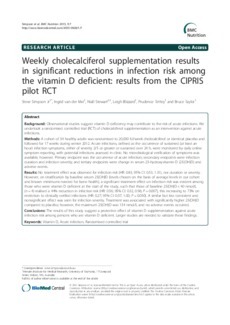 Conclusions: The results of this study suggest a protective effect of vitamin D supplementation against acute infection risk among persons who are vitamin D deficient. Larger studies are needed to validate these findings.